Discussion in 'Wildfires' started by Mick West, Nov 9, 2018. The "Camp" fire has not made much of a dent in the national news yet, but I suspect that will change as it gets light. Hundreds, possibly thousands of homes were destroyed in a single day by a fire that started just yesterday morning and is still going. Driven by high winds, the fire has devastated the medium sized town of Paradise (population 27,000), Butte County, California. There's many accounts of people forced suddenly from their home, then driving, riding, or running through flames to safety. Some deaths will be expected, but it's a chaotic situation right now. For a conspiracy point of view, it depends on what the theorists perspective is. It's either an attempted distraction from Trump's problems, or it's some symptom of geoengineering, from which the other news is a distraction. Of course it's really just the weather, geography, and perhaps an unfortunate place to have so many houses. The Woolsey fire near Los Angeles is also very serious. Three of my friends have been evacuated from their houses, with flames visible down the street. That's the area I lived in when I moved to the US. There were fires that year. Like this year it was driven by the Santa Ana winds, which will blow the fires south to the ocean, towards Malibu. Dane Wigington is already saying this "geoengineering"
California is yet again ablaze, even in November. 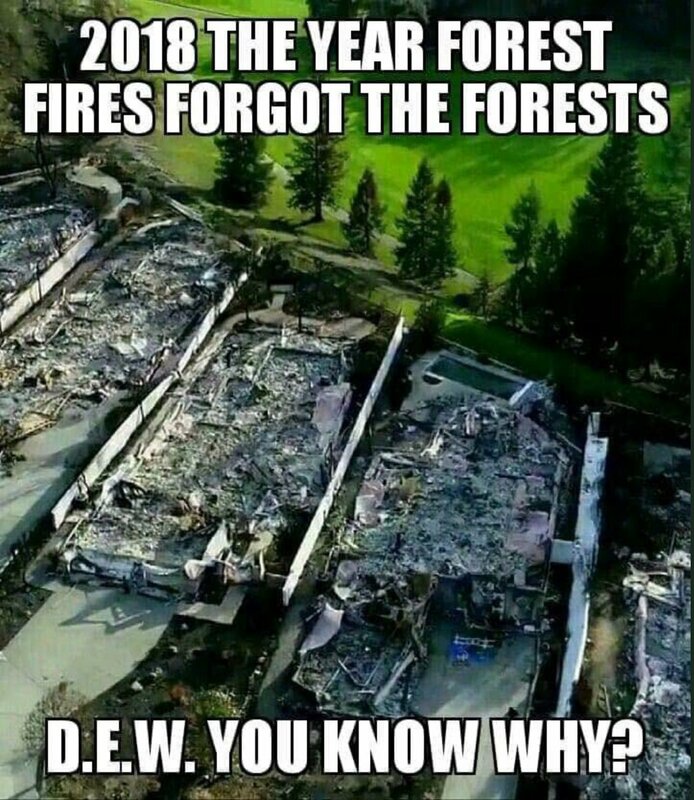 "Official sources" have tried to convince the masses that the record raging wildfires are because we are not cutting down enough trees, but is this the truth? The short answer is a resounding no. In fact, such a narrative flies in the face of countless verifiable facts. All available data makes clear that the single greatest causal factor relating to the epic wildfires all over the globe are illegal and ongoing geoengineering operations. The "Camp Fire" has exploded with blinding speed and destructiveness. How bad do conditions have to become before populations are willing to wake up to the global climate engineering insanity? Somewhat trending on YouTube, is that the cause of these recent fires could be volcanic in nature. But there have been no reports of any such activity....either from volconologists, or local residents. There has been some earthquake activity in California....but there always is some. Nothing abnormal though. Dutchsinse (conspiracy creator) seems to be the primary source of this disinformation. Since these fires started, Dutchsinse has been talking about a huge fire Near Camp Nelson that was the first and led to the other big fires. There are a couple of small fires north of Camp Nelson that started on October 4 caused by lightning strikes. They are in remote, wilderness areas, threatening no private property. The forest service is allowing them to burn for forest management. Just after 50:25 of his 11/13/2018 update video, he names this huge fire near Camp Nelson, The Camp Fire. Is the idea of volcanic activity trending due to Dutchsinse not understanding where the Camp Fire actually is? Unfortunately, all he seems to be doing, is posting real earthquake and tectonic data, but coming to unique personal conclusions........most of which is not in agreement with science. However, he has an online following that is just big enough to plant 'seeds of doubt'. and has become a trusted "expert" in some conspiracy circles. "More than a dozen wildfires are burning in California right now — some with so much intensity, they’re creating cloud formations usually seen over erupting volcanoes. The clouds, known as pyrocumulus, are cumulus clouds that form when hot air and smoke are ”released into the sky during wildfires and volcanic eruptions”, according to LiveScience. Pyrocumulus clouds, which also formed during the Thomas Fire in December 2017, have been spotted coming from the Carr Fire near Redding, the Ferguson Fire in Mariposa County, the Mendocino Complex fires and the Cranston Fire near Idyllwild, according to social media posts from meteorologists and other observers." The Geysers Geothermal Field is located in a tectonically active region of Northern California. The major seismic hazards in the region are from large earthquakes occurring along regional faults that are located miles away from the geothermal field, such as the San Andreas and Healdsburg-Rodgers Creek faults. However, activities associated with the withdrawal of steam for producing electric power cause or induce small quakes to occur in the field. These smaller quakes are frequently felt by those who work at the field and by nearby residents. Seismicity at The Geysers was poorly documented when power generation commenced in the 1960's, but since 1975 high-quality seismic monitoring data has been available, and it has been demonstrated that increased steam production and fluid injection correlates positively with changes in earthquake activity. The level of seismicity has been fairly stable since the mid-1980s, even though power production has declined in the field with the depletion of the steam reservoirs. Sheet 3 of Seismicity map of Santa Rosa, California 1969-1995 illustrates how seismicity has spatially and temporally expanded with geothermal production. So, there is a history of activity. To me, this is the most obvious flaw in conspiracy ideas regarding "trees not burnt". Then there is the idea that forest trees have been "chemtrailed sprayed with aluminum", making them more flammable. Obviously these are two separate theories, that contradict the other. If trees were more flammable, they would burn next to house fires....but they often don't. One of the ingredients in the fire retardant (attapulgus clay) that is sprayed on forest fires is actually an aluminium compound. I presume the implication is that metallic aluminium powder was used as in some thermite? I think the difference between aluminium as an element and compound of aluminium was discussed in some chemtrail thread on MB? One of the best instance of the difference between the properties of elements and of compounds of those elements is sodium chloride. Combine a high reactive and dangerously inflammable metal and a corrosively poisonous gas used in war from WW1 to Saddam Husein, and we get... common table salt. I think the idea that trees and brush will burn faster or more-readily because of chemtrail spraying....is an idea invented online, a misnomer spread by rumor, and not backed by science. One reason for the overall doubt of the rumor, is that chemtrails do not seem to be happening, as far as we truly know. To help prove this idea is false....(like actual fire tests) seems to be intensive work under controlled conditions. Such extensive testing is really not needed, until 'chemtrail spraying' is firstly verified. Fist you need to verify trees are full of extra aluminum. This situation, as far as I can tell is not noted by dedicated tree botanists in the California area. I have looked. It's the "chain of evidence"....don't test the end of the chain, when the start of the chain has yet to be examined.